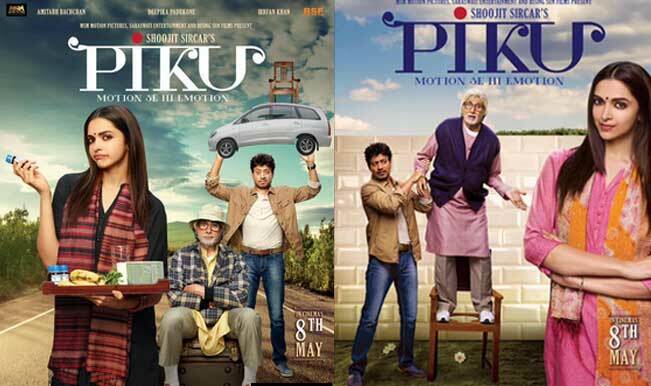 Piku is an upcoming Indian comedy-drama movie which is directed by Shoojit Sircar. Heroine Deepika Padukone portrays the titular protagonist, a Bengali architect living in New Delhi, and Hero Amitabh Bachchan plays her ageing father. This movie explores the dynamics of their relationship as they take a road trip to Kolkata. Irrfan Khan, Moushumi Chatterjee and Jishu Sengupta portray supporting roles. Piku is planned to release on May 8th, 2015. The main cast of Amitabh Bachchan, Deepika Padukone, and Irrfan Khan was finalised in mid-2014. In preparation for the role of Piku, deepika Padukone learned Bengali as her character is from Bengal. Initially, there were early reports that Jisshu Sengupta was cast as the romantic lead opposite to Deepika Padukone, but it has been confirmed that Sengupta will in fact be seen playing deepika Padukone’s best friend in the film. Irrfan Khan will play the romantic lead opposite of Deepika Padukone. Amitabh Bachchan will essay the role of a Bangali bhadrolok, while Moushumi Chatterjee will essay the role of a family member. Akshay Oberoi will play a cameo role going on a date with deepika Padukone’s character. Piku is the kind of girl who doesn’t shy away from responsibilities. This movie takes audiences through the ups and downs and everyday problems she faces with her father. Baba – Bhaskhor Banerjee (Amitabh Bachchan) is Piku’s (Deepika Padukone) father. He is retired and spends most of his time obsessing about age-related issues. He is stubborn, dramatic and comes with his own set of problems… he has very specific, but unconventional, likes and dislikes and have fixed ideologies. He is not a man who enjoys socialising. Baba is not the hero here, but this movie takes a look into his household.